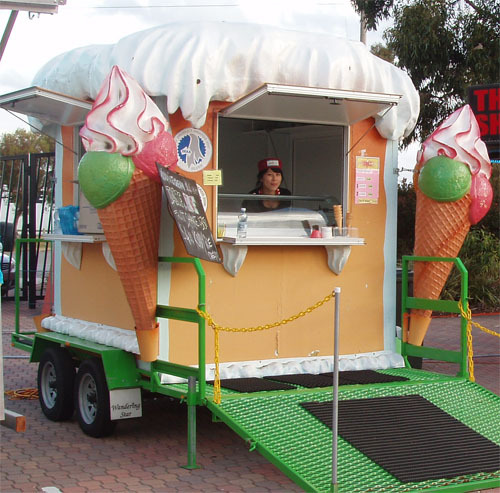 runs a mobile kiosk, which through the years has attended several events in and around Perth such as Perth Royal Show, WASO concerts in King’s Park, Fairbridge Festival, Perth City Market , Australia Day, Buddha Festival, Hawker’ s Market and many others, including private events. CLICK HERE TO SEE WHERE TO FIND US NEXT! From this year 2012, we are proud to announce that not only our Italian GELATO, but also COFFEE will be available for both public and private events. why not having the coolest Kiosk in WA? BOOK THE MOBILE KIOSK FOR YOUR EVENT!! The kiosk is equipped with a freezer, double sink, self-contained water supply and only needs a 10 amp power supply for operating. It has been yearly approved by the city of Perth as a “Temporary Food Premise” and is currently licensed. It only takes 3m x 3m of space, and being a trailer we can tow and locate it wherever needed.